Everyone talks about their diving watches being waterproof, but where’s the proof? 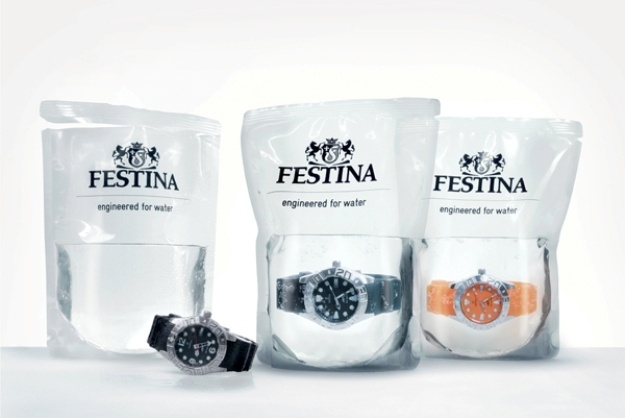 Festina decided that instead of telling you their watch was waterproof, they would illustrate it with clever packaging. The Festina Profundo Diving Watch comes packed in sealed plastic bag filled with water. The watch is immersed in the liquid from the time it leaves Festina until you rip the bag open to claim your watch. The watches are highly accurate timepieces as you would expect from Festina, but this demonstration of waterproof effectiveness is unmatched in the industry. They do not prove their watches are water resistant with a single test, every watch faces this watery transition to their owner.